MUSTERS AND DRILLS ARE REQUIRED TO BE CARRIED OUT REGULARLY IN ACCORDANCE WITH MERCHANT SHIPPING REGULATIONS. THE GUIDANCE CONTAINED IN THIS AND THE FOLLOWING SECTION BE READ IN CONJUNCTION WITH INFORMATION AND GUIDANCE ON THESE REGULATIONS ISSUED IN THE RELEVANT SHIPPING NOTICES. MUSTERS AND DRILLS ARE DESIGNED TO PREPARE A TRAINED AND ORGANIZED RESPONSE TO DANGEROUS. SITUATIONS WHICH MAY UNEXPECTEDLY THREATEN LOSS OF LIFE AT SEA. IT IS IMPORTANT THAT THEY SHOULD BE CARRIED OUT REALISTICALLY, APPROACHING AS CLOSELY AS POSSIBLE TO EMERGENCY CONDITIONS. CHANGES IN THE SHIP’S FUNCTION AND CHANGES IN THE SHIP’S PERSONNEL FROM TIME TO TIME SHOULD BE REFLECTED IN CORRESPONDING CHANGES IN THE MUSTER ARRANGEMENTS. THE MUSTER LIST MUST BE CONSPICUOUSLY POSTED BEFORE THE SHIPS SAIL AND, ON INTERNATIONAL VOYAGES AND IN SHIPS OF CLASS II A AND III SHOULD BE SUPPLEMENTED BY EMERGENCY INSTRUCTIONS FOR EACH CREW MEMBER (E.G. IN THE FORM OF A CARD ISSUED TO EACH CREW MEMBER OR AFFIXED TO INDIVIDUAL CREW BERTHS AND BUNKS). THESE INSTRUCTIONS SHOULD DESCRIBE THE ALLOCATED ASSEMBLY STATION, SURVIVAL CRAFT STATION AND EMERGENCY DUTY AND ALL EMERGENCY SIGNALS AND ACTION, IF ANY, TO BE TAKEN ON HEARING SUCH SIGNALS. AN ABANDON SHIP DRILL AND A FIRE DRILL MUST BE HELD WITHIN 24 HOURS OF LEAVING PORT IF MORE THAN 25% OF THE CREW HAVE NOT TAKEN PART IN DRILLS ON BOARD THE SHIP IN THE PREVIOUS MONTH. AS SOON AS POSSIBLE BUT NOT LATER THAN TWO WEEKS AFTER JOINING THE SHIP, ON BOARD TRAINING IN THE USE OF SHIP’S LIFE SAVING APPLIANCES, INCLUDING SURVIVAL CRAFT EQUIPMENT, MUST BE GIVEN TO CREW MEMBERS. AS SOON AS POSSIBLE AFTER JOINING THE SHIP, CREW MEMBERS SHOULD ALSO FAMILIARIZE THEMSELVES WITH THEIR EMERGENCY DUTIES, THE SIGNIFICANCE WITH THE VARIOUS ALARM SYSTEMS AND THE LOCATION OF THEIR LIFE BOAT STATION AND OF AL LIFE SAVING AND FIRE FIGHTING EQUIPMENTS. 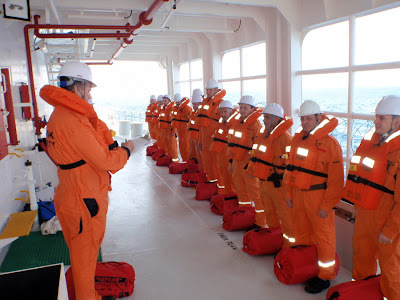 ALL THE SHIP’S PERSONNEL CONCERNED SHOULD MUSTER/ASSEMBLE AT A DRILL WEARING LIFE JACKETS PROPERLY SECURED. THE LIFE JACKET SHOULD CONTINUE TO BE WORN DURING LIFEBOAT DRILLS AND LAUNCHINGS BUT IN OTHER CASE MAY BE SUBSEQUENTLY REMOVED AT THE MASTER’S DISCRETION IF THEY WOULD IMPEDE OR MAKE UNDULY ONEROUS THE ENSUING PRACTICE, PROVIDED THEY ARE KEPT READY TO HAND. THE TIMING OF EMERGENCY DRILLS SHOULD VARY SO THAT THE PERSONNEL WHO HAVE NOT PARTICIPATED IN A PARTICULAR DRILL MAT TAKE PART IN THE NEXT. ANY DEFECTS OR DEFICIENCIES REVEALED DURING DRILLS AND THE INSPECTIONS WHICH ACCOMPANY THEM SHOULD BE MADE GOOD WITHOUT DELAY.